Registrar Registry Manager is an advanced and complete suite of tools that allows you to safely maintain your local registry as well as the registries on the systems of your network. Since many years, Registrar Registry Manager has been the expert's choice in registry management. This software offers solutions for backing up and restoring registries, fast background search and replace, a bookmark editor with categories which supports key coloring and adding descriptions to registry keys and values, detailed property pages, tools for easy navigation. The program offers multi-level undo so all registry changes can be individually undone. The software offers a registry defragmenter as well as a registry monitor which logs registry access by the system and other applications in detail. It provides security editors which allow you to set access permissions on your registry keys. An advanced registry compare tool allows you to check the differences between two keys in detail. Registry files can be edited in a separate registry window. Registrar Registry Manager now fully supports all versions of Windows 7. The Windows registry is the key to all hardware and software configuration. This powerful and reliable registry manager will help you get the most out of your system. For each Windows operating system, there are hundreds of registry tweaks and registry key descriptions included to help you find your way in the forest of system tweaking and optimization. Registrar Registry Manager includes the right collection of power tools which will do the right job in any registry editing situation. Tools include registry monitoring, blazing fast search and replace, backup and restore, advanced compare, bookmarks, a file reference editor, a CLSID utility and much more. Take a tour of features to see what Registrar has to offer. The professional version of Registrar comes as both 32-bit and 64-bit editions. On an x64 version of Window, the 64-bit edition offers significantly better performance and other advantages. 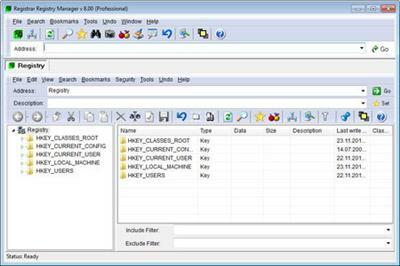 Registry file editors allow you to edit the registry files which make up the systems registry image on disk. This feature has been a life saver to many administrators who managed to recover broken Windows configurations this way. Reliable registry backup and restore features will give you the security that new hardware or software installations will not become irreversible in the case of a failure. On top of that, every registry operation performed with the program can be individually undone. Get complete control of your network by using the remote features of Registrar Registry Manager. Each remote registry will be opened in a separate window and will give you the same power and flexibility as on the local registry. The registry defragmentation tool will reclaim wasted space and keep your registry running smoothly. The advanced registry search, replace and delete tool will help you to find and destroy unwanted registry entries quickly. The new file reference editor will allow you to find registry references to non existing files. The command line edition which offers a advanced set of batch scripting utilities for registry management is now freely included in the professional edition of Registrar Registry Manager.